FRANCONIA — With her team down 5-4 to 28th-seeded Downingtown West in the second half, Souderton girls lacrosse coach Kelly Kelly called the most important timeout of the season. “It was about staying calm, as well as no body contact,” said Kelly about the reason for the timeout. ‘‘Making sure defensively, because they have so much speed, that we use our footwork…because we were relying on our stick and getting called on it. That defensive change proved to be magic, as Souderton went on a 5-0 run the final 18:23 to pick up a 9-5 second-round victory over the Whippets to advance to the District 1 quarterfinals. 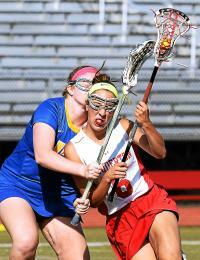 Amber Lambeth led the charge for Big Red offensively, netting five goals in the game. She also scored the first two goals of the game for Souderton to give her team an early 2-0 lead. Lambeth’s five goals came within the first six Souderton scored on the day. Her fourth tally tied the game at five, her fifth gave Big Red the lead for good at the 13:11 mark. Big Red got goal-scoring contributions from five players in all, with Carlie Doughty, Natalie Bulgier, Brittany Roynan and Juliana Ofalt netting one a piece. 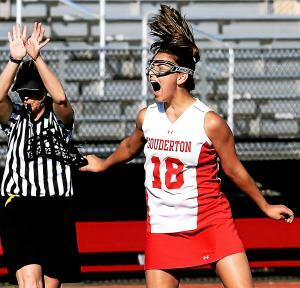 The other standout for Souderton resided in the net Thursday. Kelly Williams registered 10 saves on the day, each one bigger than the last. It would be unfair to narrow Williams’ saves down and name a “best” one, but with the game tied at five Downingtown West held some solid possession that ended with a good save by Williams. The go-ahead goal was scored less than two minutes later and Souderton never looked back. The Whippets were led by Ryan McKinney, who had a hat trick. Senior Emma Cooper added two goals of her own. 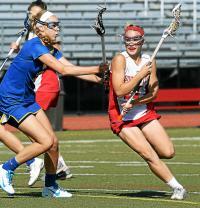 Souderton play 4th-seeded Great Valley in the quarters Saturday at West Chester East. Big Red will be the underdog, but that is not important. They have some momentum right now, and they are focused on keeping that going into Saturday. “(In the past) we’ve kind of been a team that has made it to the playoffs and then in the first round knocked ourselves out almost,” Kelly said. ‘‘This is a team that we’ve been talking all season about – playing our game, keeping our game going and keeping that into the playoffs. It’s not so much focusing about ‘we’re in the playoffs now.’ No…this is just another game, another day we get to play. That’s kind of where we’re at, staying a little mellow with it. Goals: S: Lambeth (5), Doughty, Bulgier, Roynan, Ofalt DW: McKinney (3), Cooper (2).